Little Mrs. Married: veggie dish! Place the cauliflower and broccoli in a saucepan with a small amount of water. Bring to a boil. Reduce heat; cover and simmer for 5-10 minutes or until crisp-tender. Drain and set aside. In a large skillet, saute onion and garlic in butter until tender. Stir in tomatoes, seasonings, cauliflower and broccoli. Cook, uncovered, until heated through, about 4 minutes, stirring occasionally. Remove from the heat and set aside. 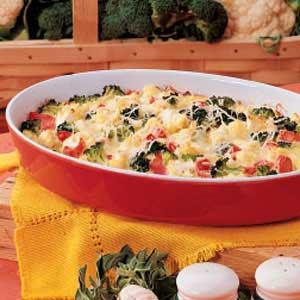 In a large bowl, beat eggs and cream; stir in 1 cup Swiss cheese, Parmesan cheese and the vegetable mixture. Transfer to a greased shallow 2-qt. baking dish. Sprinkle with remaining Swiss cheese. Bake, uncovered, at 375° for 25-30 minutes or until a knife inserted near the center comes out clean. Let stand 10 minutes before serving. Yield: 12 servings. I know it ain't any hotter than it is here! LOL. Looks great! I think you should start a recipe blog!! that looks sooo good!! yumm! !